Shangri-La Durham-Thompson’s granddaughter has brought such joy to the family and as they prepared for her first birthday, Durham-Thompson realized that all the preparations and the presents they gave to her granddaughter did not compare to the joy she brought to them. Durham-Thompson realized that all children are special gifts from God and they bring with them a special smile. This realization inspired her to write “Presenting Princess Solei on Her First Birthday: The Magic in Her Smile” (published by AuthorHouse). Nina Solei’s smile touches the hearts of all those she encounters. When her grandpa first held her in his arms, he was overwhelmed by the way her smile affected him. Because he felt such joy, he decided to call her princess. He was also touched by her beauty, her loving and smiling personality, which became more evident at her first birthday party celebration. The narrator retells this event to a young child and emphasizes the lengths everyone will go to celebrate. Yet despite the cake, ice cream and the presents, Nina’s gift of a simple smile is the greatest gift of all. The story encourages everyone to smile as smiles bring healing and shared happiness. 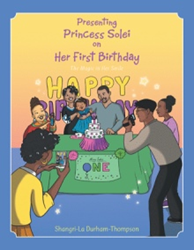 Written in a poetic style, “Presenting Princess Solei on Her First Birthday: The Magic in Her Smile” will remind readers that children are gifts from heaven and the smiles they give should be emulated by all. Shangri-La Durham-Thompson was an avid reader and first began reciting poetry as a young child. Her love for the spoken word led her to study drama education and upon graduation, she taught in an elementary school for two years. She later taught English, communications and drama at the high school level for 16 years, after obtaining her master’s degrees. After 20 years of teaching in the public-school system, she became an Arts education officer for the Department of Education. She has served as an acting middle school principal and was an elementary school principal for 12 years. She has taught public speaking and communication at the Bermuda College and today, she serves as education officer for the Arts and Leadership at the Bermuda Department of Education. In her younger years, she painted and sold visual art work. She has written and produced numerous plays and is the host of a weekly radio leadership program, “The Need to Lead.” Durham-Thompson served in her local church school as a teacher and superintendent for over 30 years. She is married to Stanton Thompson Sr. They have two sons, Stanton Jr and Shan-on. Nina Solei makes her a proud grandparent.